Sold in April 2009, the 31.3m motor yacht Queen South is now back on the market, listed for sale by Foulques de Raigniac at Camper & Nicholsons. Built by Versilcraft in 1987, Queen South has been regularly maintained and upgraded with an extension to her flybridge in 2012 while a recent refit saw her fitted with new engines. Her interior by Antonio Maggini has a large open plan saloon in light, neutral tones with four settees and a wet bar. 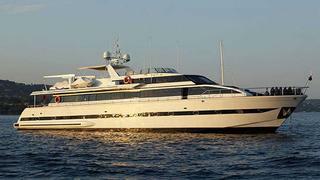 Accommodation is for 12 guests in five staterooms including full beam master and VIP suites. Expansive deck areas feature a barbecue, beach club and swimming platform and she cruises at 21 knots with a top speed of 25 knots. A special feature of Queen South is the fact that she can carry 36 passengers at sea and 100 guests at the quayside, making her ideal for event or corporate charters.